"Hello Peter, good drawings! Could you put some of the photos of these people up to compare and learn?" The fact is, working from still photos is not my preferred method for drawing caricatures. When I draw caricatures of celebrities I never use photos if I can avoid it, as I much prefer to sketch them from watching video. By seeing my subject in motion, I find that I get a better feel for their simple visual design without getting bogged down with extraneous details. Also, I am equally as interested in capturing their distinctive personality in addition to their physical likeness and this too is more easily achieved by seeing my subject in action. For me, video is my favourite medium to work from, even better than real life, as it is totally controllable in my ability to play over or pause on a single frame for studying something in depth. When I work from still photos, I must admit I can't guarantee a great likeness of the subject, as the best I can hope for is that the interpretation results in something fairly close to the reference photos provided. So, having said that, I now present for you the way I work when limited to still photo reference alone. My first step is to download as many of the pics as I think may be helpful to draw from by placing them in a file folder. At this point I then open them all up on my computer desktop and just look at them for awhile, glancing from one pose to another in order to try and see the underlying "design" of the face. So now I'll use these three examples to attempt to explain my thought process in working out the caricatured likeness. This "Wolverine" lookalike is Adam Pate. As I study the selection of photos Adam has provided, I first try to see the overall shape of his head and face. Adam has a very wide, blocky jaw structure and a sturdy neck. His head shape seems to taper in narrower at the top. I keep everything loose at this stage of my drawing, as I may need to go back and fine tune things as my drawing progresses. Next it's onto the facial features themselves. The facial features should be analyzed in three different ways: 1) Their relative spacing and placement on the facial plane, 2) their relative size to each other, and 3) their distinctive shape. My visual impression of Adam's face is that his features are close set along the vertical centre line of his face with plenty of open space for the wide jaw and chin. Size-wise, he seems to have a large nose, small eyes and narrow mouth in its relaxed state. When I study the shapes, his eyes are slanted up and narrow with small light coloured irises. His nose flares out at the bottom with prominent nostrils. The mouth is always the most flexible feature, so I based its shape specifically on his expression in the 4th photo. I like the way his eyebrows arch upward in some expressions, so I portrayed them that way. In fact, Adam's face is very much based on a series of angular, alternating 'V' shapes. Sometimes I like to mentally compare a subject's face to a famous celebrity I've drawn before, and in Adam's case I thought there were some similarities to Kevin Kline and also, strangely enough, the young Peter Ustinov! My next subject is Ken Coogan, or "Coogy" as he goes by professionally. Coogy's got a long narrow head shape that is swept back in a convex facial plane as can be clearly determined from the profile in the 5th photo. Because of this, my impression is that his features are stretched along this vertical space with a small chin that is close set to a long thin neck. His longish nose keeps the eyes and mouth separated some distance from each other. His eyes are squinty and heavy-lidded when he smiles and he has prominent lips. The shapes of his eyes and mouth are based on more curving 'U' shapes that head in opposite directions from each other. There is a droopiness to his features. Again, like in Adam's face, I chose to portray Coogy's raised eyebrows that I see in some of his expressions. As I drew Coogy, I couldn't help but think that he has similar features to that of comedian Garry Shandling. Finally we come to Angie Jordan. Some aspiring caricaturists are somewhat unsure of how to approach drawing the face of an attractive woman, yet one should not shy away from the challenge. Overall, Angie strikes me as having a very angular head and features, which are in great contrast to the softer, curvier features that are seen on Alison Gelbman at the top right corner of my previous montage. In determining Angie's head shape, I am more inclined to draw her in a 3/4 view so that I can play up her high cheekbones and angular jutting chin. Her nose also juts out from the facial plane, so I see the overall design of her face as being made up of "arrows" thrusting forward and slightly downward at a 45 degree angle, with bridge of nose, mouth and jawline all parallel to each other. I like the expressiveness of her eyes in the 3rd photo, so I play up that wide-eyed look, giving her a lot of white space around her irises. Her mouth stretches wide back to her cheeks when she smiles, with all of her flesh taut to the bone. With females, it's also fun to study how the hairstyle works with the design and framing of the face. Angie's hair is long and straight with an interesting tuft in front that hangs down towards her eyes. Again, I must confess that I have no idea how much these caricatures may or may not capture the subjects, as I have never met my NCN colleagues in person to have formed a visual impression of them. If I had good video reference of these folks to sketch from, I would likely end up with somewhat different results. By the way, my Sheridan students will recall that I distinctly have instructed them to draw people for their sketchbook assignment either from life or from video, and NOT from still photos. Until you have experienced drawing people in a caricatured fashion from life, you will not be able to draw them from still photos with the necessary skill set required to make informed artistic choices. Believe me, even I feel hindered when drawing from photos and would far rather draw my NCN friends from real life in order to get a more accurate feel for what they're all about. Anyway, one of my favourite areas in the forums is "The Firing Squad", where members can post a selection of photos of themselves as fodder for the rest of us to sketch from. It's quite fascinating to see the myriad of variations that result, with each artist interpreting the subject in their own individual way. At this point I have sketched over 50 of my colleagues and posted them in the forum, as it's a lot of fun and keeps me in practice with what I love to do. Here is just a random sampling of some of my fellow NCNers - I'll post some more over the next little while. Fact is, I really enjoy drawing what people really look like. By that I mean, not just drawing the same generic, cookie-cutter face and body design over and over again, but instead really observing the individual "design" of each person's face and then trying to exaggerate and simplify it into something appealing, while hopefully capturing the essence of their personality as well. I thought it might be a good time to post a montage of these faces on my blog, as I am currently going to be teaching my Sheridan animation students all about "Character Types". In other words, designing a character that somehow communicates to your audience what he or she is all about through the face and body type, essentially doing the same thing in cartoon that a casting director is concerned with when selecting the most appropriate actor to fill a role in a live-action film. During this first semester at Sheridan, my students are also required to keep an ongoing sketchbook of drawings of actual people they see, but caricaturing the features and bodies as if they were studies for potential animated film characters. I am of the strong belief that by studying what individuals look like, this will hopefully result in them producing character designs that are richer in personality as well as more visually interesting in their variety of shapes and sizes. By posting my own caricatured drawings of these NCN members, I'm hoping this will give my students a clearer understanding of what I am looking for and why. In upcoming posts I will discuss more of the thought process that goes into doing these. This past April at Sheridan College saw the screening of the 4th Year films from a very talented group of students who would shortly be graduating from the BAA Animation program. I'd had this bunch just two years prior in my 2nd Year Character Design class, and now that they've graduated and moved on into their careers, I don't mind saying that I'm going to miss seeing all those crazy rascals. One of these students was Melissa Maduro, who always had a great knack for drawing very appealing cartoon designs with a lot of personality, and I always enjoyed seeing her work when I was grading assignments. Even though the gal seemed to have a peculiar fascination with comedic zombies. After the screening on Sheridan's annual Industry Day, I felt that Mel's film, "A Romance in Graphite" was among the better ones and it got a very good reception from the studio reps in attendance that day. It was also admittedly one of my favourite films for its simple, yet charming story told with humour and elegance. As it happens, "A Romance in Graphite" was one of the films in competition this past week at the Ottawa International Animation Festival in the category of Most Promising Student Film, with a scholarship from Teletoon as the prize. Actually, there were a number of other Sheridan grads in the running, including Vlad Kooperman for his incredible film, "C Block". Regardless of who has won the scholarship (and I haven't yet heard the results) I believe that Sheridan had some very worthy contenders. 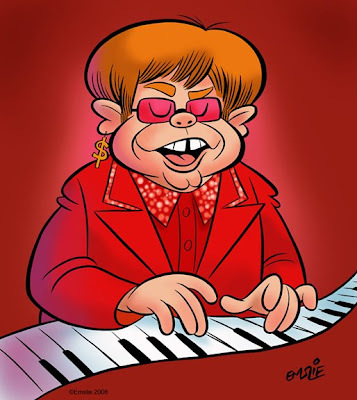 Every month on the National Caricaturist's Network forums they run a contest where a subject is chosen and everyone is invited to upload a caricature of that person. Though a prize is awarded to the winner, I think the real fun is just in the drawing and jumping into the fray. August's subject was Elton John. There were some really neat entries this time around and I decided to sketch Elton from a combo of his short interview on "The Lion King" DVD, plus from watching him in concert in various YouTube clips. As I've mentioned on here before, I always prefer to work from video footage as opposed to still photos, as I get a far better feel for the physical design and personality of my subject that way. Incidentally, when did Elton go from being that skinny balding kid he started out as, to the middle-aged pudgy with the wig? 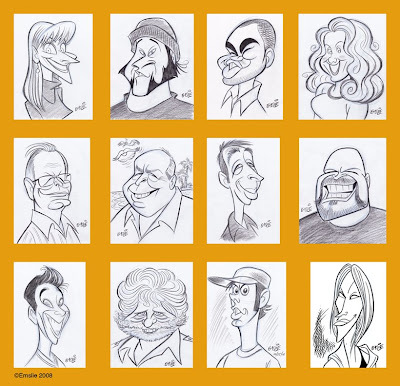 Back in the spring I joined the National Caricaturist's Network, or NCN for short. 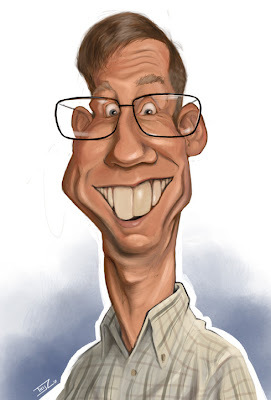 Since becoming a member I have been able to meet many very talented caricaturists online from all over the world. In their discussion forums there is one area they call "The Firing Squad". It is there that members are encouraged to upload photos of themselves so that everybody else can draw them. I drew a bunch of the artists who already had pictures up, but then they told me I should really post some photos too so they could get back at me. So I took a bunch of digital photos of my funny looking mug and put them up for the rascals.